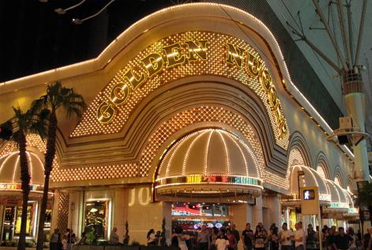 There are many different places that you can stay at if you go to Las Vegas , but many people love staying at the Golden Nugget because of the novelty surrounding a stay at this particular casino. For example, the Golden Nugget has been featured in many of the poker television programs of late and while the casino has gained much popularity, people have been pleasantly surprised by the resort as a whole as well. A combination of the wealth implied by the name and theme of the resort as well as the excellent amenities has catapulted this resort into the spotlight. The Golden Nugget resort is not located on the Las Vegas Strip. However, it is located within walking distance of the strip. For people that would like to avoid the noisiest parts of the city at night so that they can get some sleep this is certainly a good thing and this is primarily why many satisfied customers would argue that the Golden Nugget resort is located in the perfect place. The noise level is reduced but all of the great entertainment, nightlife and dining venues are still within walking distance of the location at which the Golden Nugget is located. The Golden Nugget Resort has some of the best accommodations in the city. The main thing to keep in mind about the accommodations at the Golden Nugget Resort is the fact that the Golden Nugget Resort has a lot of choice for you when you make the initial booking. If you want to stress cost you can go for one of their tower rooms which are not as luxurious but certainly save you a lot of money. However, if cost is not an issue for you then you can go for a spa tower suite or a gold club room, both of which are really wealth and style epitomized. These are fantastic rooms that are not cheap, but certainly are worth their weight in gold. Another reason to love Golden Nugget is the fact that there are a lot of extras involved. These extras include things like being able to play in the casino and poker room that comes with the resort as well as being able to enjoy amenities like the spa and salon services that are available. People that prefer competitive atmospheres might get a kick out of staying in the arcade all day or playing a round of golf on the course that the Golden Nugget has. Once the day is over however, you can retire to one of the fantastic restaurants located inside the resort and enjoy a fresh meal cooked with a high amount of quality before retiring back to your accommodations and getting a good amount of sleep before you strike out the next day on another Las Vegas adventure. The Golden Nugget Resort is certainly where it's at. If you want a cool resort that is ultramodern and understands exactly what makes customers happy, the Golden Nugget is the resort for you.